Hello there! Did you know that our kitchen is finished? Yes – I finally taught myself how to sew, which meant I could finally make shades and finish the project! It’s just a wee bit different now. Just about everything is new. We kept the same layout (in an effort to keep the cost down), and only the wood trim and the beat-up maple floor remain (we tell people it’s “charmingly rustic”). You may remember that we (OK, me – I’m taking 90% of the credit on this one) tiled the backsplash. I’ve had a few people asking about the process, wanting to know if it’s very difficult. I’m happy to say that it was pretty simple! Neither of us had tiled before, but I’ve seen it on TV. If people on Trading Spaces could do it, I was pretty sure I could handle it. ;) The tile store gave us a sheet of paper with instructions, the tools we needed, and we were set. We used a manual tile cutter (a little device that scores each tile), and a handheld tile saw. A clamp is helpful too (check out our fancy tools). Our arms were pretty tired by the end of the project, so I’d recommend spending the extra money and renting a wet saw. The most difficult part of the process was applying the silicone caulk between the tile and the countertop. Dang, that was tricky! I’m not bad with caulk, but silicone is goopy. Oh, it also has the added benefit of smelling terrible. We kept wiping it off and starting over until I finally figured out the trick… Pushing the caulk gun instead of pulling it made a much cleaner line, which you can then smooth with your finger (dip it in water first). Lastly (and this is the important part), you come back the next day with a razor and spend four hours cleaning up the scraggly bits. Ugh. Originally, I had wanted Roman shades for the kitchen windows. I quickly abandoned that idea when I remembered that I’ve never sewn before, so I decided to try my hand at something easier. I made pole pocket panels that were the same size as each window, and hung them with tension rods. I gathered the fabric, making soft folds (you could hold them in place with binder clips, which I only realized after making Brandon hold the first two panels for me). Then I looped ribbon over the top and tied into bows along the bottom. Easy peasy! I feel like I should have something profound to say about remodeling a kitchen, but I don’t. I’m just glad that we’re done. White Walls? Paint the Cabinets? it looks awesome nicole!!! wow, it’s gorgeous. i love your little decor touches. not too over the top. because i’m looking for ways to organise kitchen storage… how did you store the small kitchen appliances (i.e. cake mixers, sandwich press, toastes, kettles)? Nicole, the curtains are especially pretty. I love the ribbons. I am going to start trying my hand at sewing, too (prompted by the fact that the house next to us has been remodeled and is for sale – soon, we’ll have neighbors) and want to make curtains for our 1919 bungalow. That looks fabulous! We’re on the verge of re-doing our kitchen, and white cabinets with dark countertops are on the list along with a tiled backsplash. What’s the paint colour? Very nice! It looks *amazing* — well done! Looks great! Where did you get the fabric? Great job on the sewing. See pick your projects wisely and it is not that hard at all. Oh I really want to learn to sew too! Did you just take a deep breath and plunge straight in or did you get someone to show you/find a good book? Oh, it looks great! I love the shot with the sink and that lovely vase. Since others are asking for “specs”—are the cabinets Ikea? A “wee” bit different!?! WOW!! You both did such an amazing job, love the subway tile and those gorgeous shades, great job! Your kitchen looks fantastic. You can congratulate yourself on a job well done. You should be proud of yourself! wow it looks great! I love your curtains! Awesome! I love how it turned out, especially the tile and curtains. Great job on the kitchen. I wish i could see your house in person. I bet it is just *ahem* lovely. Y’all do amazing work AND you can say “we did this” and NOT mean you hired someone to do the actual work. You must love your house. I sure would. Oh. Roman shades aren’t really that hard. You can actually get tape with rings already attached to sew on the back. You should give it a try. Drey, I keep the small appliances (waffle maker, mandoline, toaster, etc.) in the bottom cabinet to the right of the stove. My stand mixer and coffee maker are out on a counter (over here). Laura, only one of our windows still had the divided panes on the top half (and they weren’t in great condition), so I just went with shades from the top. It sounds like maybe you’d be better off with café curtains? Feel free to email! Anon, the paint color is Benjamin Moore’s “Bronzed Beige”. Lecochonrouge, the fabric is by Amy Butler (I ordered it from Reprodepot a few months ago). Paola, I just took the plunge! I sort of had an idea of how to sew, and I just followed the manual to get my machine threaded and working. Anon, yes – the cabinets are from IKEA. We had to save some money somewhere, and they’re actually pretty nice. Mary, we had professionals install the counters. We ordered them at Lowe’s, and they actually won’t let you install them yourself. I guess they’re too tricky (and expensive), so they don’t want homeowners messing them up during installation! So, yes – they were on the expensive side (I think we spent $2700 on them). They were one of the big splurges for us though, and the undermount sink was included for free. I think they elevate the whole look of the kitchen though, especially since we did save money with less expensive items that could have just looked cheap otherwise. hello! i found your site somehow, some time ago (how’s that for vague…) and have loved seeing everything you are doing to your new home! Looks Great!!! Having a new kitchen is gotta be one of the BEST feelings. :) I love your roman shade you made. I have attempted to do this yet,..I hate sewing. Keeping the Layout the same is a great idea to keep the cost down, that is what we did in our house too. hurray, looks insanely awesome, you guys are really an inspiration!!! Where did you find information on installing your own tile? We’re hoping to install our own tile backsplash as well. You’ve done a beautiful job! Love it! Your kitchen is beautiful…. I feel inspired. You also did a wonderful job on the curtains. Wow. I’m jealous. Can you come over to my house? What kind of countertops are they? Nicole, I LOVE the curtains!! I’m inspired because I don’t sew either and your solution is perfect. Is that Amy butler fabric? Its sooo cute. I’m also so encouraged about the tiling project (Ugh, I HATE CAULK, don’t get me started) b/c we still have to do our backsplash too. I’m brand-new to this blogging thing and thought I would make your blog my very first stop on the commenting express! Great job on the house–its looking so beautiful and really feels like a home. We’re just embarking on buying our first home (122 y.o. cottage in Chicago). I’ll look to you for inspiration! Kidding, it’s great! 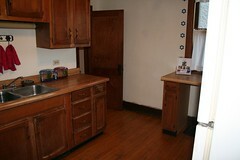 Been trying to decide on a counter top to go with cabinets like that myself and I think the black is what we’ll go with. Your shades are adorable and the entire kitchen looks amazing! Great job Nicole! 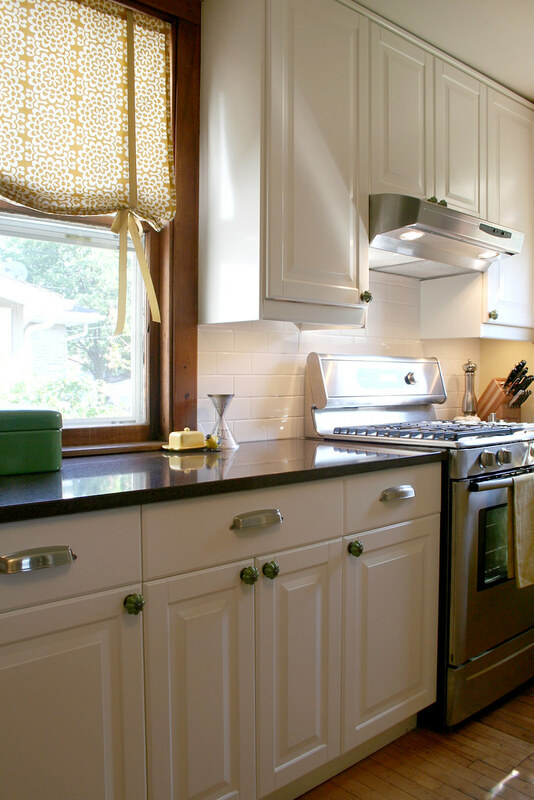 I am a white cabinet fan and love the black counters with subway tile backsplash. As a matter of fact, this is just what I had in my last kitchen! Great Job! where did you get the drawer pulls? The shades are super crafty – well done! I love it all. I love your remodeling job. You’ve inspired me to try my hand at tiling and roman shades. Nice work! Hmmm… Feather Your Nest, could you be referring to the “Eat” sign that my wonderful husband ordered for me? ;) It’s above the fridge – I’ll have to take a photo! Betsy, we were handed a sheet at the tile store. I’m pretty sure it was by the manufacturer of the grout that we bought. So, yeah, we weren’t really prepared. I got my training from years of watching HGTV for that project, haha. The counters are actually brown (Saddle Brown) Zodiaq quartz. Lara, The drawer pulls are from Restoration Hardware (Gilmore, I think) and the knobs are from Anthropologie. Thanks for the positive window treatment feedback, everyone! I’m pretty proud of them, being my first sewing project and all. i see my favorite ikea item in your kitchen…that step stool. I love the weight and sturdyness of it. very un-ikea. The last time I caulked the tub I put painters’ tape on the tub and on the tile, caulked between the “lines” and pulled up tape. No scraping. Don’t know why no one thought of this before. your curtains are really lovely. i really think they are so great- love that ribbon! We just picked up eight pallets of cabinet parts and appliances from IKEA and they’re all stored in our dining room waiting for installation. I will have to keep coming back here to remind myself that all will be OK. We’re using the new Nexus flat fronts. I also wanted to give a few suggestions based on your remodel. If you’re under an even tighter budget, my friend re-did her ugly brown 70s cabinets by going the opposite direction – she painted hers black. She got some sort-of-expensive sea glass counters, but Armstrong makes some super cool solid surface called Mica that looks amazing and is not that pricey. It comes in a few dreamy colors, as well. She also added 1/2 bun feet to the kick plates to create the illusion that her cabinets were actually individual furniture pieces. Like you, she used Anthropologie pulls for a more eclectic look. It looks so beautiful, all of your rooms are such an inspiration. OK, now I need to know where you found the adorable little yellow flowers in the vase by your kitchen sink! Wow, I love the new look. Where did you get the adorable vase? 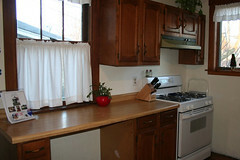 I have “Antique Brown” granite counters with off white cabinets and it would look perfect in my kitchen too! Would love a source on that. LOVE your site…where did you get those precious yellow flower/poofy things that are in that gorgeous, fun vase??? i think a cluster of those here and there would be GREAT in any house!!! You’re kitchen is gorgeous! I am thinking about doing an Ikea kitchen myself. Are you happy with the way the cabinets have held up so far? What a great job and a very happy room to be in! It means more having done it yourself, I know that feeling. Congrats to you for a lovely job! Hello! I love your blog and I’ve ordered some things from your lovely shop. Anyhow, I am in the middle of a kitchen redo and I love your faucet. Can you share the brand and where you purchased it? I’ve been looking for something similar. Thanks! wow. LOVe this space, nicole. silly question considering all the awesomeness that is your kitchen but can you tell me what those yellow flowers are called? want. need. Hi Nicole – question about your homemade blinds – what do you mean by pocket panels? Can you explain a little how you made them and what materials you used? I’m such a sewing novice, but I’d like to try my hand at something similar in our office. Thanks so much! I love them. Hi Nicole! I love your kitchen. We are thinking about going with Ikea cabinets to cut costs like you did. I was wondering, since your reno was so long ago and you have had plenty of time to test them out, would you go with Ikea now? Do they stand up to daily use? Anything you wish you would have done different? 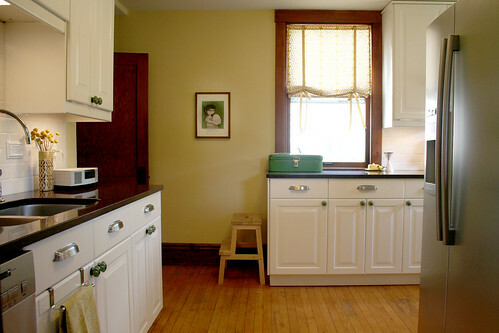 Also, if it’s not too intrusive, would you share a cost break down of your kitchen reno? This is such an inspiration! 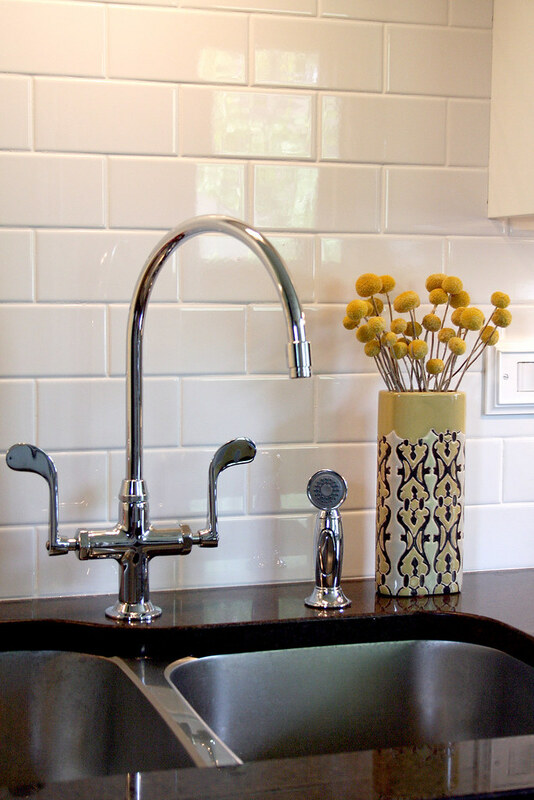 Did you tile the backsplash before the upper cabinets were installed or after? In the picture it looks like your tile goes behind them, but I couldn’t be sure. May I ask what brand your faucet is and where you purchased? I love the black/white/yellow vase by the sink! ooo, this kitchen makes my heart ache a little bit. My husband and I bought our first house in Logan Square last February. I wish I could just snap my fingers and this would be my kitchen. I love your beautiful kitchen! 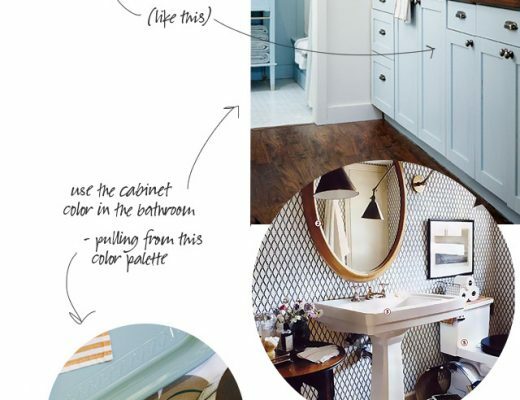 I would love to go with white cabinets someday when we do our big knock-down-a-wall remodel…do you still love the white now that you’ve got a toddler around? That’s my fear – that my cabinets will show those grubby little fingerprints easily and I’ll be too lazy to keep up! Love the white kitchen! My husband and I are contemplating a kitchen renovation. What brand is your stove and where is your microwave? Just another tip for caulk application. On all the home improvement shows they use two strips of painters tape, one on the counter another on the backsplash and caulk in between, that way they get a nice even line. Haven’t tried it myself yet, but I assume it works. I have just found your website. It is a better read than the traditional Home & Garden type magazines that clutter my Kitchen. It is a great kitchen, I think you were better with the handsaw – a wetsaw might be quicker cutting the tile, but by the time you get one, set it up and clean up after the thing – you could have cut the tiles anyway. And you have definitely made it lovely! The countertops and white cabinets really compliment each other very well! Inspiring. I really like the furnishings that you have used here, making it look ‘homely’ yet still clean cut and tidy. Looks so much better than it did before. Great work! Wow. Your kitchen looks great. Just saw your living room on twitter. So beautiful, too. We are thinking of doing an Ikea kitchen when we redo ours. We are definitely an Ikea family (it is such a great store). Are you happy with how the cabinets have stood up? Have you had any issues with the taps that you have fitted? I used what look to be the same ones, and after 6 months had a leak from near to the handle when using the cold tap. Is it just me? 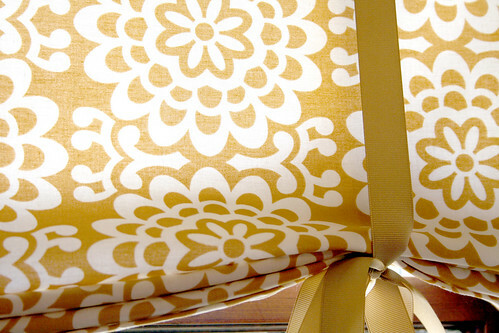 I love your kitchen window fabric!Where can I find it? Love your new kitchen! 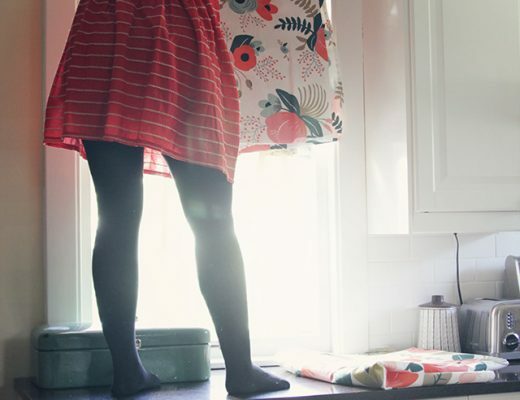 Would you mind sharing where you found the fabric for your kitchen window? It’s Amy Butler’s Lotus fabric.